The Ganaraska Forest Centre has offered high quality outdoor education programs to schools and youth groups since 1978. Now, you can choose a one-day visit, or multi-night residential stay in our new building, with dormitory rooms that accommodate up to 80 children, separate and dedicated teacher's suites with their own bathroom facilities, and a full-service kitchen and expert culinary staff that can meet any dietary needs. Check availability at the Ganaraska Forest Centre. Our programs offer unique opportunities for experiential and collaborative learning while giving children the gift of nature. Visiting teachers are able to choose from a variety of science, social studies and outdoor pursuit activities to complement their visit to the Ganaraska Outdoor Education Centre and to make it meaningful and enjoyable for all students. All of our programs align with the Ministry of Education curriculum, with some perennial favourites including orienteering, outdoor survival skills and pond study programs. 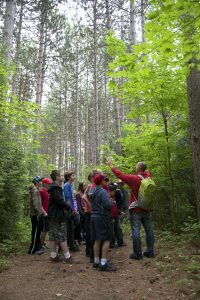 The Ganaraska Forest Centre’s outdoor education programs meet or exceed the criteria of the Ontario Physical and Health Education Association's (OPHEA) Safety Guidelines. All instructors are Ontario-certified teachers, with outdoor education emphasis, and combined, have several years of practical, hands-on teaching experience. Our staff will work with you when selecting your programs to create a fun, interactive and hands-on learning experience for any age group. Check out this video highlighting The best in outdoor education ever. All of the instructors at the Ganaraska Forest Centre are Ontario-certified teachers in good standing, with Outdoor Education Emphasis and several years of experience. They are all CPIC-cleared and certified in CPR, First Aid, AED, and Workplace Health and Safety and Accessibility training. We’re not just a camp; we are a highly regarded, well-supervised and professionally staffed centre, offering the best in experiential learning to our visiting students for 40 years now, with all programs meeting or exceeding the OPHEA safety guidelines. Having some challenges getting your trip approved? Please contact us on how we may help in presenting the appropriate safety, supervision and risk management information to your administrators. Best regards, Ganaraska Forest Centre staff: education@grca.on.ca or 905-797-2721.